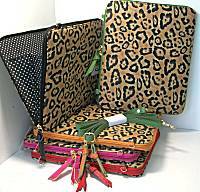 On this page we gather ANIMAL PRINT handbags and accessories, gathered from several of our artistically inspired designers! Animal prints are a strong fashion element, some years stronger than others. But always the natural patterns appeal to us, nicely mixed as accents with other colors and fabrics. We offer classics like leopard print, zebra stripe, reptiles, and a bit more! 2-3/8 inches long, 1-1/8 inch across. Coated paper pieces are colored black and white with a feathery brush stroke so it is not a bold contrast look, much like a leopard coat might look! Clear crystal bead dangles in opening. Surgical steel post for pierced ears. Soft and thin cow leather tapers from 2-1/4 to 1 inch wide, about 11 inches long. Designed to wrap and overlap the narrow end over the wide, closing first with velcro (easy), then securing further with snap. Choice of sizes for snug wearing, you do not wear this like a bangle! The leather has embossed python texture, colored in rich shades of tan and brown with a bit of silver. Dozens of Swarovski crystals in smoky topaz brown color line the outer edges and over the snap. Soft and thin cow leather tapers from 2-1/4 to 1 inch wide, about 11 inches long. Designed to wrap and overlap the narrow end over the wide, closing first with velcro (easy), then securing further with snap. Choice of sizes for snug wearing, you do not wear this like a bangle! The leather is embossed with croco pattern and colored in brown with light slate blue in hint of metallic sheen. Dozens of Swarovski crystals in pale blue sapphire color line the outer edges and over the snap. 2-1/4 inches long, 7/8 inch across. Clip on style for all ears. Lead-free pewter elements have brushed shiny top finish, with recessed areas blackened. The artsy asymmetrical appeal of these earrings is the similar shapes for left and right, but the patterns are inverted. Oval spots and curvy stripes, an art deco take on perhaps animal prints or wavy geometry, and an easy pairing for many everyday outfits.